Still snowed in? Cold? In serious need of some comfort food? Me, too! In a large stockpot, bring water to a low boil. While waiting on the water, coat stew meat with oat flour. Coat a skillet with olive oil and brown stew meat in skillet over medium heat. When water comes to a boil, gently add potatoes, carrots and onion. When the outer layer of the meat is browned, add it to the stockpot with the vegetables. The meat will finish cooking in the water. To thicken stew without making it lumpy, put 2 Tbs. oat flour in a sealable jar. Add some of the stew stock to the jar, place the lid on the jar, and shake vigorously to mix the flour and stock. Once the mixture is incorporated and lump-free, stir it back into the stew. As the stew continues to simmer, the flour will thicken the stock. Season stew to taste with garlic powder, salt and pepper. Continue to cook stew at a simmer/low boil for at least 30 minutes. 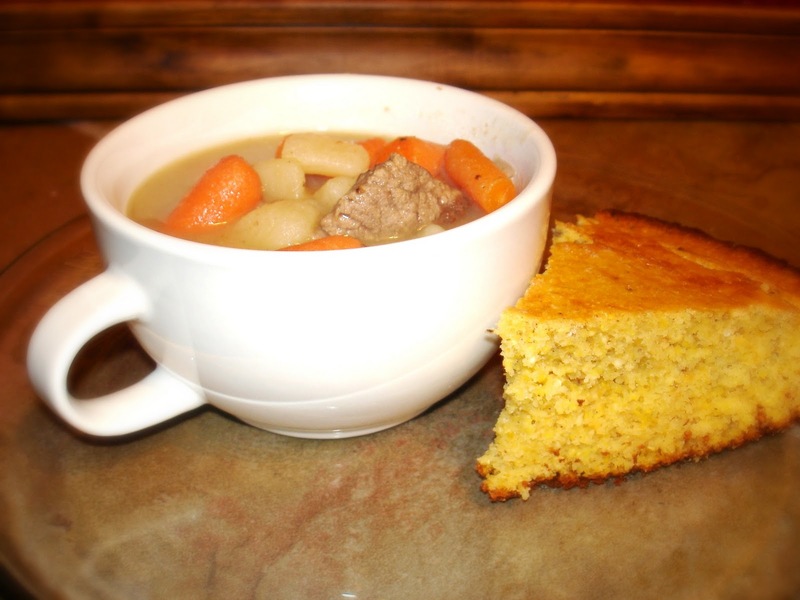 Serve with a large slab of Deb's Cornbread. Fantastic recipes, glad you reminded me about your blog, Aunty loves it.